Andrés Iniesta came home today. 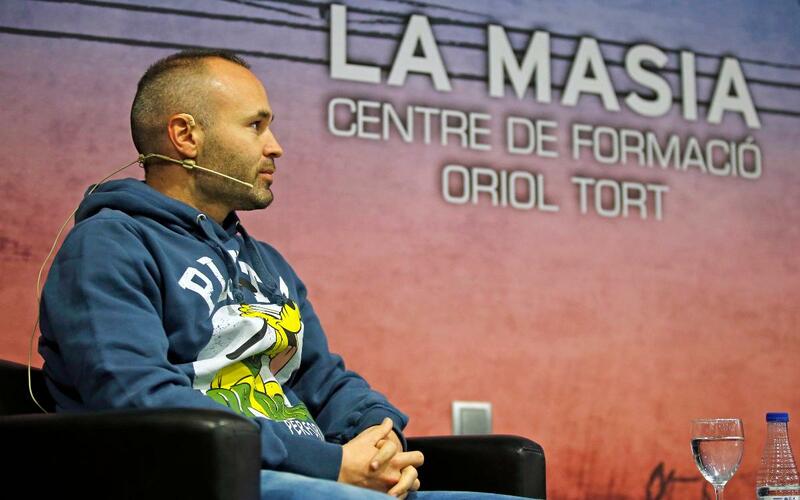 The Barça captain shared his personal experience of living in the Masia, from his arrival in September 1996, with the young sporspeople at the Masia residence, Centre de Formació Oriol Tort. He spoke of the journey he undertook and how he managed to become one of the most important players in the club's history. The talk was organised by Masia360 and is part of the education that the residence provide. This education has four main blocks: Personal development, risk prevention in sport, sport and health, cultural understanding. Iniesta enjoyed the company of the young players and he spoke of his decision to leave Fuentealbilla to come to Barcelona. He remembered his first days at the Masia; his first training session with the first team coached by Llorenç Serra Ferrer, when Iniesta was only 16; the dark times which he went through following Dani Jarque's death; his gesture towards his friend when he scored the World Cup winning goal in Johannesburg; and finally, the success he has had with Barça and his role within a legendary team in which Xavi, Messi and Iniesta are the leading figures.